I am such a sucker for Miracle on 34th Street. What is it about this film that enthralls and endears no matter how many times I’ve seen it? 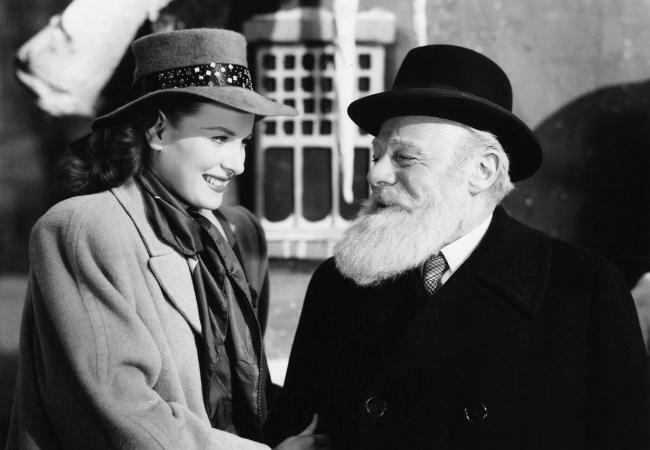 For me, the miracle of Miracle on 34th Street is not the fact that Santa may be real, but that our leading lady, Doris Walker, played by the gorgeous Maureen O’Hara, is transformed from efficient, independent, and dogmatic, to sweet, inclusive, and romantic. Since changing the human heart is one of the hardest things in the world to achieve…to what, or to whom, may we attribute this magic? Well, please. To Santa of course!… Or, more specifically, to Santa’s infallible, invincible, incredible, insatiable, unalterable ability to express affection. Having just recently seen Miracle on 34th Street (on the big screen of an old-fashioned movie palace no less), I have been asking myself over and over: What is it about gentleness that reaches the human heart so deeply? Obviously, kindness is not kind without it, and sweetness and sarcasm are separated by it. But what makes it one of, if not the, most powerful motivator/influencer in the human arsenal? 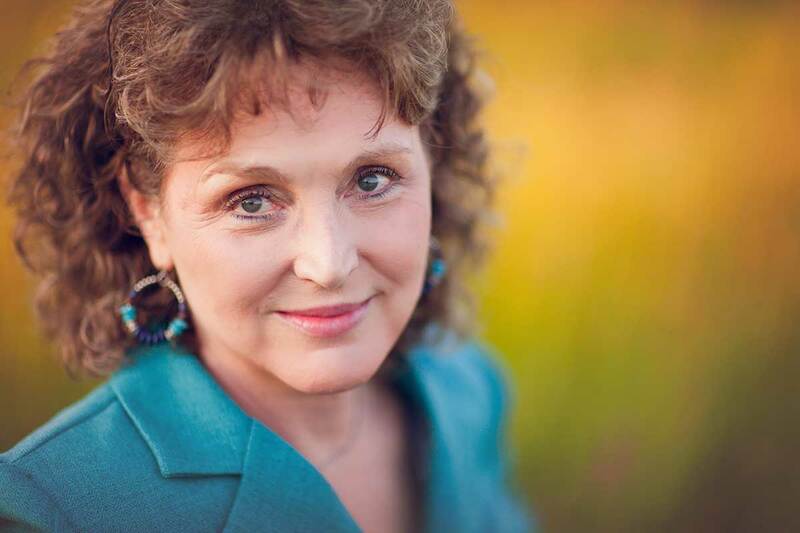 Doris Walker’s entrenched philosophical disdain of “fantasy” for instance, rendered her unable to exercise faith, to trust her own heart….and yet…the twinkle of Kris Kringle changed everything. The influential impact of kindness and affection will always be the consummate curiosity to me because of this amazing paradox: True Affection has no agenda! All affection wants is to say: I enjoy your company, right now, in this minute, just as you are. And yet — even with no other object in mind than to express sincere fondness and attachment — affection persuades! And it persuades so gently, so imperceptibly, so gradually, that the object of affection has no idea they are being revolutionized by it. The worried brow relaxes, the defensive wall crumbles, the suffocating heart breathes again, and rolled-away dreams unfurl. Would you like to participate in or experience that kind of miracle? 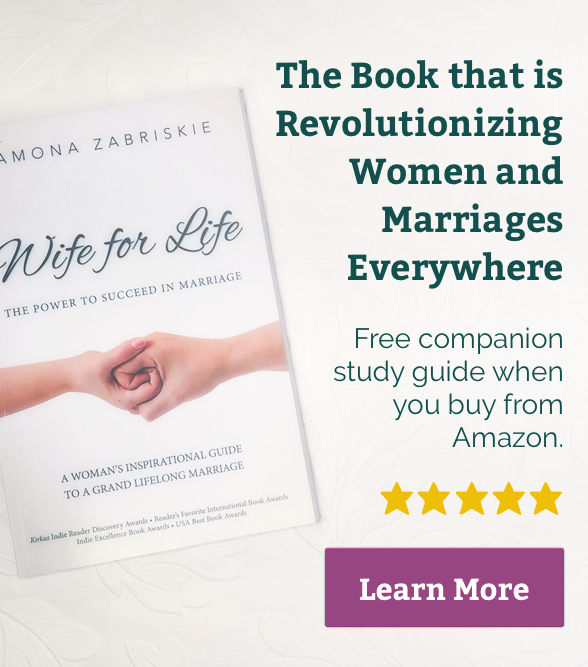 Just think what could happen in your marriage and family! It’s not hard. There’s no complicated formula here. Gentleness…tenderness…care…: they can be expressed in so many ways; the list of delights and simplicities is longer than Santa’s. You just need awareness to overcome affection-amnesia, and you too can unleash the mystical power behind the tiny touch, the loving look, the laugh, the sparkle, the smile. Leave a comment on this post to be entered in The Fourth Annual Wife for Life Classic Hollywood Christmas Giveaway! 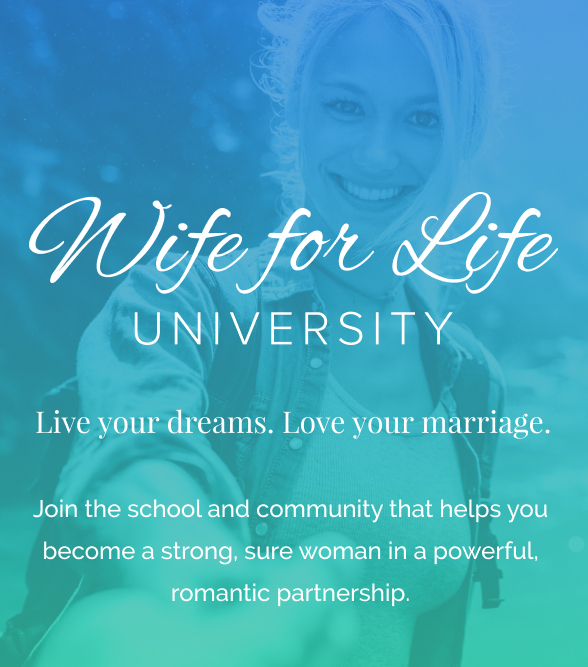 All thoughtful commenters on this blog between now and 11:59m PST December 31st, 2018, will be entered in a RANDOM.ORG drawing for one of FOUR Hollywood Christmas classics on DVD (including It’s a Wonderful Life) as well as an autographed copy of Wife for Life: The Power to Succeed in Marriage. Each comment (one per post please) will count as an entry. Come back and comment on all the Hollywood Christmas Classics blog posts (published Wednesdays in December) to better your chances! Boy, did I need this reminder! “True affection has no agenda.” It’s definitely something I want to work on, because I cringe to think of when I subconsciously HAVE an agenda…instead of just showing affection, staying aware and in the present moment. I think it’ll be revolutionary! I sp agree Adele. It is tricky to stay so purposefully and presently engaged with anyone – but especially the person who we are so used to just “being there” for us and the person we NEED and expect so much from. And Adele, the no agenda feels SO good – so freeing! This is true. Once I felt hurt and betrayed by something my husband did. His genuine affection for me and commitment to do whatever it took to win me back over was endearing. It was gentle persuasion and I could not help loving him for it. Love your analogy to snow Deb. Ire-affirms the principle that consistent efforts over time do effect change. Our efforts toward our loved ones gradually add up to something beautiful, even though we may at times feel like they are tiny and disconnected. Affection really does change hearts and relationships. Staying present is key to affection. When we are present with another person, we are in the moment, not harboring past resentments or seeking needs to be met in the future. We are simply free to enjoy the moment with the person we are with. It is a beautiful concept, simple, yet substantially life changing. Thanks for the reminder! You have reminded me of the Deep Impact these classic Christmas movies had on my young life. They slowly have been replaced by louder , entertaining traditions…. I am so excited to show these Classics to my children and remind the new generation of these basic principles of love and affection! “Gentleness, meekness, love unfeigned…” The greatest form of love. I love that analogy, too, Deb. I find the simple hugs, cuddles, I love you mama from my kids touches my heart so much! I try to imagine what they would like for so I can help touch their sweet tender hearts as well. Play, read books, sing and be silly. I try to take time with each child so they know I love them. Such timely advice, thank you for sharing! Gentle affection is a win-win for everyone. I hope my husband and kids will feel that through me today. Thank you! I like this reminder, gentleness. I feel like to accomplish this (if one is struggling), that one requires patience and a change of perspective and attitude. I think you’re right Julie. My other articles in this series play right into the change of perspective that you’re talking about. All of the W4L Ten Laws of Attraction work best if worked together — and all represent an intentional way of looking at our loved ones. So far in this Christmas classics series we’ve covered Approval, Appreciation, and now, Affection. Next up? You’ll see next Wednesday! Thank you for commenting! Ooooo Robyn! I love that. We’re going to introduce new deep-dive workshops into various W4L principles in the new year and that affirmation would be ideal for a workshop into the W4L Ten Laws of Attraction. Thank you! So true. Thanks for the reminder. I think gentleness is so important. I know it makes a difference not just for my marriage but with my kids too. Showing gentleness and affection changes me too. Might need to watch Miracle on 34th Street again! Kerryann, you are so right. Affection affects ALL our relationships but is especially powerful (and overlooked) in our own immediate family. I couldn’t agree more. Over the second half of 2017 I have learnt the power of affection first hand. My husband got sick in May (49yr) and a week later had triple heart bypass with lots of obstacles and complications along the way. Six months later his is still pretty poorly and struggling physically and mentally on the path to recovery. I have found that one of the best boosts for him is my unconditional affection and gracious care. I realised it is easy to look after someone who is poorly but takes way more to care for them. I found it was essential both for him and me to always care with Grace (not always easy). And with him being poorly affection is essential for us. It’s one of the most powerful ways I can communicate to him just what he means to me and how I’m still by his side. And affection lifts and expands. And it is a hook for joy and laughter. Without it I would be all alone and with it I still have joy and a prospering marriage. It is literally keeping him alive. It doesn’t take much to start being affectionate but it grows and grows. “A gentle feeling of fondness or liking”…what a beautiful description of affection! I have found it helps my marriage greatly when I stop to do the little things in terms of affection: scratch his back, reach out to hold his hand, cuddle in bed, comb his hair with my fingers while we’re driving. It means the world to my man! That’s beautiful, Catherine. Part of the affection “recipe” is being sensitive to what others (our husbands especially) appreciate in terms of affection. Some love touch, as your husband obviously does. Other simple ways to express affection that don’t require even touching a person include our voice or the look in our eye. I’m curious, how does your husband express his affection for you??? My husband is so good at this! He is always ready with a hug, a smile, reassurance, or whatever else I may need. He is so gentle and loving and is sensitive to my thoughts and feelings. I am so grateful to have such an affectionate husband. Wow Katherine! You’re wise to be so appreciative. How do you show him affection? I love that movie! I think the reason I love it is because Santa is so good at showing affection to everyone, no matter who they are or what they have done. It is a good reminder that no matter what is going on in my life, or the lives of my family members, they just need my unconditional love. That will help them get through the tough times and hopefully emerge better from them. One thing I need to be better at is doing little things each day to show my affection to my husband. This was a great reminder to me. Anne-Marie, I’m so glad. We ALL need reminding. Hopefully, though, it can become a way of life, part of our relationship, more and more natural! And you are so right, affection is important with the whole family. Ramona, I so look forward to all of your emails. I watch many of your videos and am always encouraged. Thank you for putting a different spin on the Christmas classics. Such insight! Lee Ann, that is SO kind of you to say. Thank you!!!!! I like to watch that movie. She gradually softens toward the man that is called Santa Claus and toward the people around her. My husband has told me that a little honey draws more flies. People respond better to sweet than sour. Thank you for sharing. Merry Christmas to you. May we all pour out affection this Christmas and the year to come! Beautiful reminder as we move into this holiday season. Ramona, what a beautiful way to convey the true *magical power* of affection? You are indeed an incredible writer that blesses us all women (and hence their men and children)! I’m taking it easy this holiday as well, and my tree is still missing most of its ornaments but I’ll get to it when I can. I’m focusing more on the love and harmony I want to create with my husband and daughter at home because that makes me happy most :). Farinaz, I’m so glad you’re “taking it easy”… I know that means you’re letting go of the “to-do” list we create and impose on OURSELVES, especially this time of year. Bravo. I love the explanation on affection, just enjoying and accepting. I need to jot a few reminder notes. DO! Writing ideas down is a great way to solidify understanding and resolve, as I’m sure you well know, Marni! You’re helping me to see some of my favorite holiday movies from a new perspective, Ramona, and I love it. This post is such eloquent testimony to the power of the small moments, and I needed to remember that. Oh Kristin! I’m so glad, of course! That’s my hope! I love the three things you mentioned about affection That it persuades, that it accepts people just the way they are and that it has no agenda. I’ve been thinking about my family and the way I’ve been communicating has not been working, I feel ignored and unheard the majority of the time like I’m talking to a wall…and now I know why, I’ve put up my own wall to true affection for myself and therefore others. Gentleness is a Goddess gift that I want to receive and I love that awareness to affection amnesia is the cure! Thanks for helping me see clearly! Stacia! Hooray! Such a simple act and change of perspective. I promise, it’s powerful. I appreciate you Ramona! And I have never seen any of these films so I would love to win one! I love the definition of affection! I love finding great definitions that help me understand exactly what a word is capable of communicating. For example, I have often heard the “encouragement,” “endure to the end.” I kind of always read that in line with “long-suffering!” WHO WANTS THAT?! So, one day I looked up the definition of ENDURE. It said: “to continue in the same state.” To apply this scriptural reference to marriage, I would say that it is admonishing us to continue, throughout our marriage, in the same love and joy and excitement we started our marriage with! If we can endure in that way, we will most definitely have a truly lasting marriage, and a fullness of joy! Thank you for your amazing insights! I have so much to learn from you! I learned about you through power of moms, and boy, am I grateful!!! I am wanting to send your book to a friend of mine, as well as get one for myself so we can read your book together and discuss. I am already finding your website, etc… to be so enriching. So, thank you for an opportunity to win your book! Angela! How kind of you and how fortunate that we’ve met now! I will continue to do my best to provide helpful info and inspiration. YOU have inspired me! Once you and your friend have your books, both go to ramonazabriskie.com/book and get free study guides! Wow, needed o read this one! I’ve read it three times now! For the 1st day in … a long while I had a moment with my spouse where he was aware of me affectionate without an agenda! I’ve been wondering how often I have an agenda? How often am I kind, expecting something in return? How often am I hoping to persuade him rather than just be with him in the moment! He has made a huge effort to be my friend lately! I am grateful for his taking initiative and being my example of affection without an agenda! Dezie, so glad this one resonates with you. You’re right, affection is bottom-line to any friendship — especially the one we want to cultivate with our husband! I need this reminder about gentleness every day, for the way I interact with my kids, my husband, and anyone around me. I love your quote, “I enjoy your company, right now, in this minute, just as you are.“ Surely God does this for us as well. It is so liberating, isn’t it, Brittney, to just let yourself love and be loved, “as is”.